That fact is as old as the oldest forms of government, but recently there’s been a new innovation, Trumpification. It used to be then when caught in a lie, politicians either walked back the lie or apologized for it. 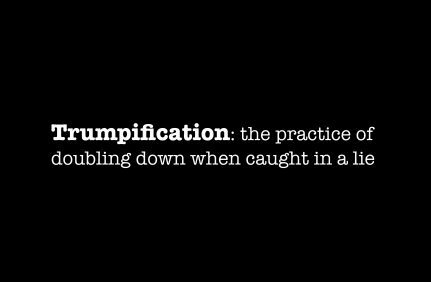 Trumpification calls for those caught in lies to double down on them. The current US President is the master of the technique. Even his followers are aware that he is lying but, like him, they are sure that the ends (“owning the libs”) justify the means. It’s bad enough in politics but it is absolutely unacceptable in science. Yet, when it comes to breastfeeding research nearly every major health organization is engaged in Trumpification. The lie is that breastfeeding has lifesaving benefits. Over the past decade or so nearly every major claim about breastfeeding’s benefits has been debunked by research that controls for socio-economic factors. Most of the purported benefits of breastfeeding are benefits of wealth. Sadly, that hasn’t stopped the lying; indeed many major health organizations Trumpified that claim and doubled down. Why? Because they are sure that ends — both stated (improving babies’ health) and the unstated (punishing formula companies) — justify the means. The latest example of the Trumpification of breastfeeding research is a misleading, fundamentally unethical proclamation from the American Academy of Pediatrics entitled Evidence can help pediatricians explain why moms should breastfeed by Joan Younger Meek, M.D., M.S., IBCLC, FAAP. Nearly every single “benefit” of breastfeeding touted in the announcement is either unproven or, worse, debunked. I suspect that Dr. Meek is aware of that. Nevertheless, she and the AAP have doubled down on claims that are at best deliberately misleading and at worst are outright lies because in their minds the ends justify the means. A history of breastfeeding was associated with a reduction in the risk of acute otitis media, nonspecific gastroenteritis, severe lower respiratory tract infections, atopic dermatitis, asthma in young children, obesity, type 1 and 2 diabetes, childhood leukemia, sudden infant death syndrome (SIDS) and necrotizing enterocolitis. That is deliberately misleading. Dr. Meek and the AAP know as well as I do that “associated” is not the same as “caused by.” Furthermore, with the exception of necrotizing enterocolitis in premature babies and a few less episode of colds and diarrheal illness, none of those claims are true when confounding is taken into account. According to Dr. Meek and the AAP, breastfeeding reduces the risk of asthma. Really? 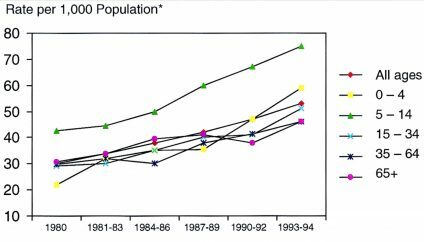 This graph shows trends in asthma prevalence by age, from the 1970’s when the breastfeeding rate hit its nadir of 23% through the 1990’s when it had risen to 60%. 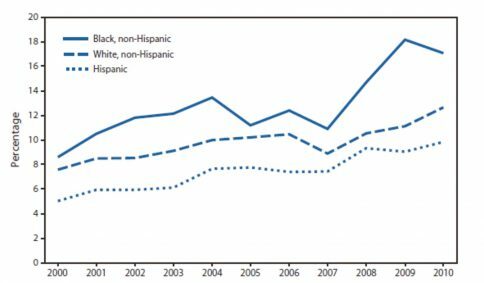 As you can see, the US breastfeeding rate rose by 150% and the rate of asthma not only DIDN’T fall, it rose dramatically. How about the claim that breastfeeding reduces the risk of atopic dermatitis? From 2000 to 2010, as breastfeeding rates rose from 67% to 75%, the rate of atopic dermatitis DIDN’T fall; it rose. For mothers, breastfeeding was associated with a reduced risk of type 2 diabetes, breast cancer and ovarian cancer. This, too, is deliberately misleading. “Associated with” is another way to say that there is a correlation. As nearly everyone knows even if they never studied statistics, correlation is NOT causation. This is precisely the type of “reasoning” used to such deadly effect by anti-vaccine advocates. They note that MMR vaccination is “associated with” the onset of autism and erroneously conclude that vaccines cause autism. They note that the rise in number of vaccinations is “associated with” a rise in the prevalence of autism and erroneously conclude that this is yet more “proof” that vaccines cause autism when it is nothing of the kind. Furthermore, I recently reviewed the paper on which these claims of association with maternal benefit were based and found that the quality of evidence used to claim association was either weak or insufficient. There is NO high quality evidence that breastfeeding is even “associated with” with the lower risk of these diseases, let alone evidence that breastfeeding causes a reduced incidence of these diseases. Meek and the AAP double down on the biggest lie of them all. [M]ore than 820,000 lives a year could be saved globally by improving breastfeeding practices. The claim is based on a faulty mathematical model and is thoroughly undercut by the actual evidence. At its peak, formula use in developing countries resulted in 65,000 deaths per year, almost ENTIRELY due to contaminated water, not formula itself. That peak occurred in 1981. Since then the annual death toll has decreased to 25,000 per year due to increased access to clean water. That’s only 3% of the lie routinely broadcast by major health organizations like the AAP. It used to be then when caught in a lie, scientists either walked back the lie or apologized for it. Major health organizations like the AAP and the World Health Organization should acknowledge their misleading, unethical tactics and make it clear that in industrialized countries the benefits of breastfeeding for term babies are trivial. Instead they continue to Trumpify by doubling down on misleading statements and lies. They should be ashamed of themselves. I would be happy to publicly debate Dr. Meek, in person or in print, about deliberate efforts of the AAP to mislead women on the purported benefits of breastfeeding, but I’m not holding my breath that either she or anyone else at the AAP will accept that offer. Trumpification is so much easier and far more satisfying. ← Breast is best … except when it’s not! I emailed CPS, SOGC, and the BC Ministry of Health…A rep from the Ministry responded 2 months later with this “As noted on the Healthy Families BC page you highlighted, leading experts – including the World Health Organization, Health Canada, Dietitians of Canada and the Canadian Paediatric Society – recommend breastfeeding for two years or longer, with exclusive breastfeeding recommended for the first six months of an infant’s life. These recommendations are based on decades of research. Given your interest in the evidence behind breastfeeding recommendations, you may enjoy visiting some of the web pages hyperlinked above. Breast milk is the safest and healthiest food for a baby. It’s easily digested, nutritious, free, and promotes overall healthy development. 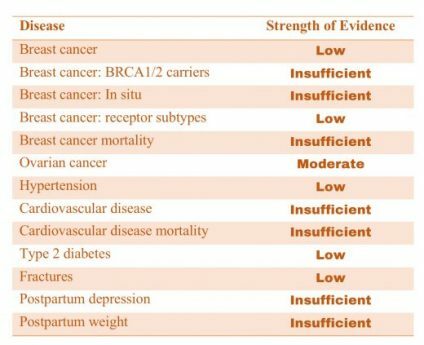 Breastfeeding can also be beneficial for the parent, as it may, for example, reduce the risk of certain cancers.” I responded to a bunch of claims she made in her email (with actual evidence and studies)…almost a month and no response. I hate how much BM is glamourized. I really hope these organizations change their stance. The authors are also playing on the general public misunderstanding of how statistics work. A large reduction in a very low risk (if scary) outcome is often mischaracterized as “the reason people avoid getting _______”. It’s not; most people will never get the scary outcome regardless of their life choices. For example, the population risk in the US for women’ lifetime risk of ovarian cancer is around 1.5% That means out of every 1,000,000 women 15,000 will be diagnosed with ovarian cancer – and 985,000 will not be. Breastfeeding is associated with a 20-30% reduction in lifetime risk of ovarian cancer which means the lifetime risk drops from 1.5% to 1.05-1.2% That means that out of the 1,000,000 breastfeeding women, 10,500 women will be diagnosed with ovarian cancer and 989,500 will not be under the most dramatic reduction. That means that 4,500 cases of ovarian cancer would be prevented, but that’s a drop in the bucket compared to the 985,000 women who would never develop ovarian cancer regardless. Right. And if family history and genetic testing show you at a high personalized risk of ovarian cancer, talk to an oncologist and consider getting them removed. The claims about fewer colds, respiratory illnesses, and asthma were part of why I made myself crazy trying to breastfeed. My husband and I both get sinus infections nearly every time we catch a cold and I had multiple bouts of bronchitis and one but of pneumonia before I turned 8. We also both have terrible seasonal allergies that started in early childhood. Sparing our son all that was great motivation. If one credible person had pointed out during pregnancy or early postpartum that these claims were bogus or even that we were already giving our son a leg up by not smoking (we were both raised by smoking parents and I was babysat by a smoking grandma), I’d have stopped sooner and with much less guilt. Seriously stop guilting moms under the guise of science already!